Scott had a busy day on Saturday, with two basketball events sandwiching a trombone audition for the All-County Honor Band. Well, today we found out the results of his audition: Scott will be 2nd-chair trombonist in the band! He beat out several 8th graders (a year older and more experienced than he) for the position. 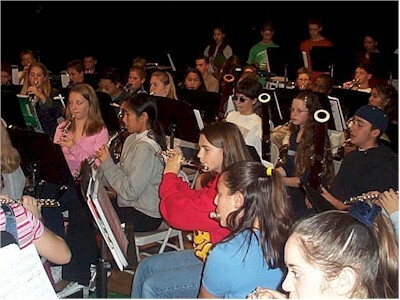 This is a photo of Matt in last year's Honor Band. He's the trumpet player on the right, wearing a white shirt.